If things go according to plan, the sounds of the New York subway system could change by 2019. At least, that's what Heineken is hoping. The idea—making the sound of subway turnstiles into little pieces of music—comes from musician James Murphy, formerly the front man of LCD Soundsystem, who has been working for years, to no avail, on what he calls the Subway Symphony. But now Murphy's got corporate sponsorship from Heineken, which is bankrolling the project and sees it as a way to showcase how the private sector can partner with the public sector to improve cities across the globe. Working with people to make their cities more magical is something Heineken would like to be doing, taking its "Cities of the World" campaign from last year a step further. There's only one problem: New York's Metropolitan Transportation Authority isn't cooperating with Heineken or Murphy on the project. So, the brand is documenting its work in a new series, hoping that as the public learns more, there's a greater possibility of making the project work. "We felt like we should be doing things to make cities a better place to live, even if that was by adding a little bit of magic, versus fixing potholes or curing diseases," said Quinn Kilbury, senior director of marketing at Heineken. "That's not who we are; that's not what we are. We sell beer in the end, so we are trying to be consistent with that. If a beer brand is going to go into civic duty, it should be in a way that's about fun, and magical, rather than something that's more serious." 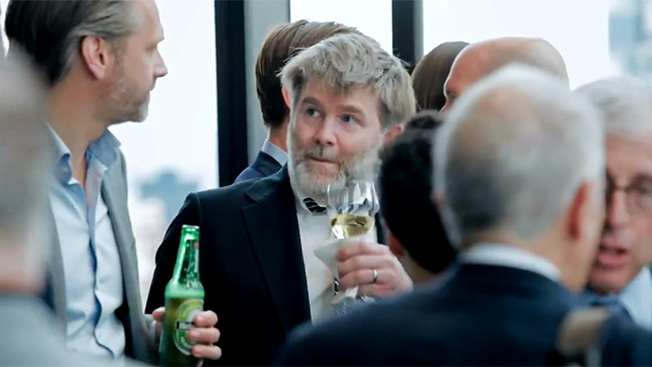 About a year ago, as Heineken was looking for a project to kick-start the initiative, Kilbury attended a dinner hosted by Droga5 and the William Morris Endeavor. It was kismet; Murphy was in attendance and told Kilbury about his idea. According to Kilbury, "We got into a conversation, and one thing led to another—and here we are." But Heineken isn't looking to solely work with celebrities like Murphy on civic projects. "We thought it was important that we didn't want [the projects] to necessarily be our idea," said Kilbury, "because while we can kind of speak to city life globally and in a macro sense, the people who know their city the best are the ones [who know how to make it a better place]. What we are looking for are people who represent their city and have ideas to actively make their city a bit more magical." And that's how the brand see's Murphy's Subway Symphony, which is costing Heineken as much as a standard digital summer campaign, according to Kilbury. Heineken spends $60 million to $80 million a year, globally. Initially, Heineken was working with agency Wieden + Kennedy on the project, but its split from the agency earlier this summer delayed the release of the documentary videos. Now, even though the brand tapped Publicis Worldwide to replace W+K, it has kept the project in house. "Originally, the intent of the Subway Symphony—we were trying to work directly with the MTA—[Murphy] had tried that for a number of years, and they had never spoken to him," said Kilbury. "We were hoping we could have a direct conversation with them, and they weren't really looking to do that with us." Given the silent treatment from the MTA, Heineken and Murphy decided to document their work and hope it would spark public interest. "We're going to try to get public support, and governmental support, on this and kind of capture it in real time with this documentary," said Kilbury. "It's a different way of doing it but the only way we thought we could do it." As Kilbury tells it, Heineken and Murphy see the Subway Symphony as something the MTA could install when it updates subway turnstiles for the "Tap and Ride" program, which is slated for 2019. "They're going to be changing all of the turnstiles anyway—and at that point, they move from an analog model to digital model—and [adding the Subway Symphony is] just changing the code," said Kilbury. "There's no additional fee, no additional cost on top of what they are already going to be spending on the Tap and Ride." In the meantime, the brand is hoping to test the project in just one station. "Then you're only talking briefly updating those turnstiles in this one station with this new technology," said Kilbury. "We've built that technology, and it's functioning already." Heineken tried for months to set up meetings with the MTA, even going as far as hiring political consultants with connections, but was never able to land a single meeting. Such setbacks could have made the brand back down from the project, Kilbury says, but Heineken is committed. The MTA has "a lot of big issues to deal with, so honestly, we get it," said Kilbury. "We want to make sure we can respond correctly to what their concerns are, and now we know their concerns [because the MTA has spoken to the press]. We want to package this up as nicely as possible, so there's really no work for them to do, and then test it. And if it works, we've just made 6 million people's day better twice a day, and that's a positive for them." Still, the project is a bit of a leap of faith, said Kilbury. "We see the same research that every other brand in the world sees—about the shifting belief system in the U.S. amongst millennials, and people in general…. People feel better about brands that have an active, positive role in society," said Kilbury. "Our belief is that we're going to get some benefit on a local level from people believing that we care, and that's actually pretty hard for a global brand."